Kevin McCartney, Professor of Geology at the University of Maine at Presque Isle, has had two scientific articles published in international journals this spring. These publications represent his 50th and 51st major articles with international distribution and include co-authors from Poland, Russia and Japan. Both articles are on silicoflagellates, which are single celled algae with quartz skeletons that live in oceanic waters. However, McCartney explained that the two articles could not be more different and still pertain to silicoflagellates. “One article is on fossil silicoflagellates from their early history, while the other article deals with the name of a key silicoflagellate that is the most widely distributed silicoflagellate in the modern oceans,” he said. The first article, published in the international journal Micropaleontology, is on fossil specimens that date from the Age of Dinosaurs and were found in sediments from the Ural Mountains of Russia. The article includes extensive photographic treatment of a variety of species, some of which McCartney has described in previous work from the Arctic region of Canada. Many of the species, however, have not previously been observed in Eurasia. His co-authors in this paper are Jakub Witkowski from Poland and Maxim Kulikovsky from Russia. The second article, published in the international journal Phytotaxa, is simpler but more important scientifically. 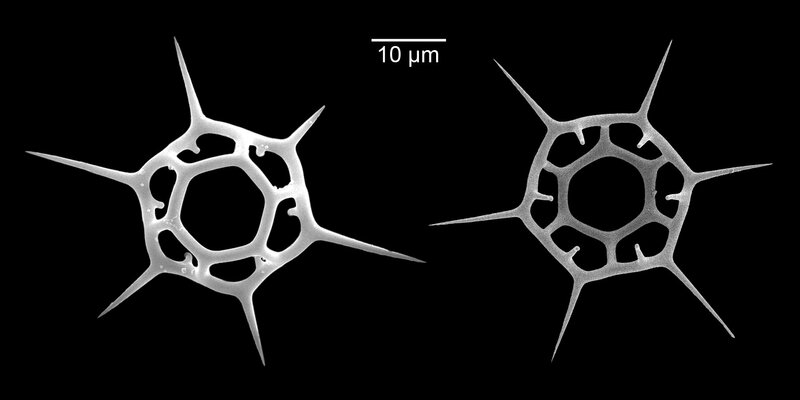 Among modern silicoflagellates, there are two important groups: the genus Dictyocha, that has simpler skeletons, and the genus Distephanus, with more complicated skeletal structures. Both were initially described in the 18th century and now include a great many species, both modern and fossil. However, the genus Distephanus is invalid when applied to silicoflagellates because the name was previously described and is still used for a wildflower. The invalid status of Distephanus as a silicoflagellates genus has been appreciated for more than 20 years. However, McCartney explained that the process of naming a replacement genus, known as taxonomy, is complicated. This requires an examination of the silicoflagellate literature that relates to every species that has been described within the genus, which, for Distephanus, is a huge number of species. Working with Richard Jordan, an expert on taxonomy based in Japan, McCartney proposed the replacement name Stephanocha (“crown holder”). The new name is an important one since this will be applied to all silicoflagellates previously placed in Distephanus, and any new species to be described in the future. This is the fifth genus that McCartney has described, but is by far the most important as it has an especially extensive geologic history, and is the best known and most widely distributed in modern oceans. Stephanocha is, however, an “adopted” genus, while the other four genera were first discovered and described by McCartney. If the replacement name receives general acceptance, all of the species previously placed in Distephanus will carry the names McCartney and Jordan after the species’ original author. “And this is a little bit of scientific immortality,” McCartney said. These articles also mark a major milestone in McCartney’s scientific career. He has long had the lifetime goal of 50 significant contributions to the scientific literature. These papers are extended over a life’s work of 30 years, beginning in 1984 while a Ph.D. student at Florida State University. A list of these papers can be viewed athttp://connect.umpi.maine.edu/~kevin.mccartney/mcpubs.htm. He has additional articles currently under review and in preparation.